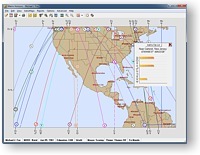 Hi-resolution maps ideal for quality printing. 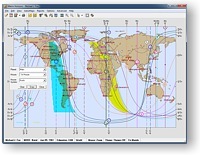 You can also export these maps in formats easy to e-mail to your clients anywhere in the world. Extensive reports. 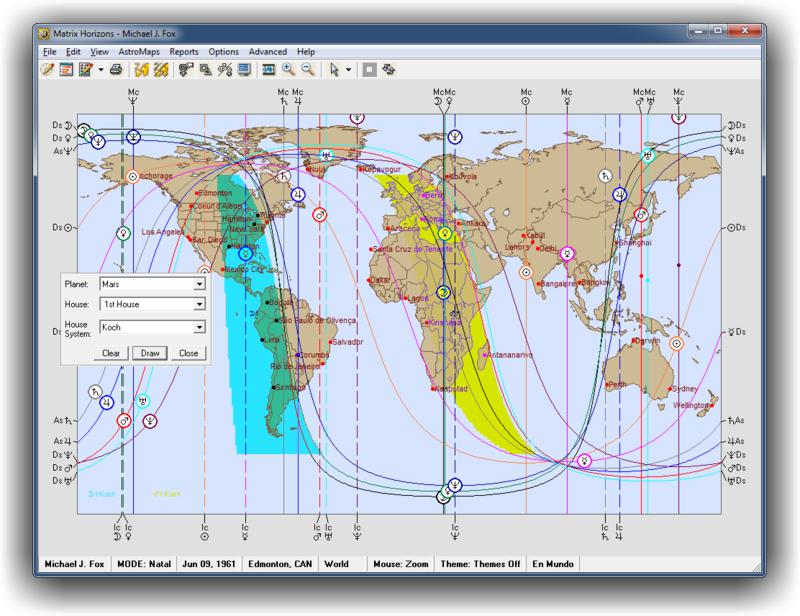 Including: Planet line interpretations for Relocation, Relationship, Composite, C*C*G, and Transit reports, with additional interpretive text for aspects, midpoints, parans, and Local Space. 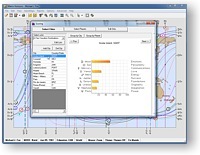 Add chart wheels, maps, and scoring graphs to your reports, and output them in PDF, Rich Text Format (RTF), and HTML. Total flexibility in choosing what to display and how to display it. Including: planets (Uranians and key asteroids also), aspects, midpoints, and parans. Click a button and instantly display house influences across a selected geographic area. 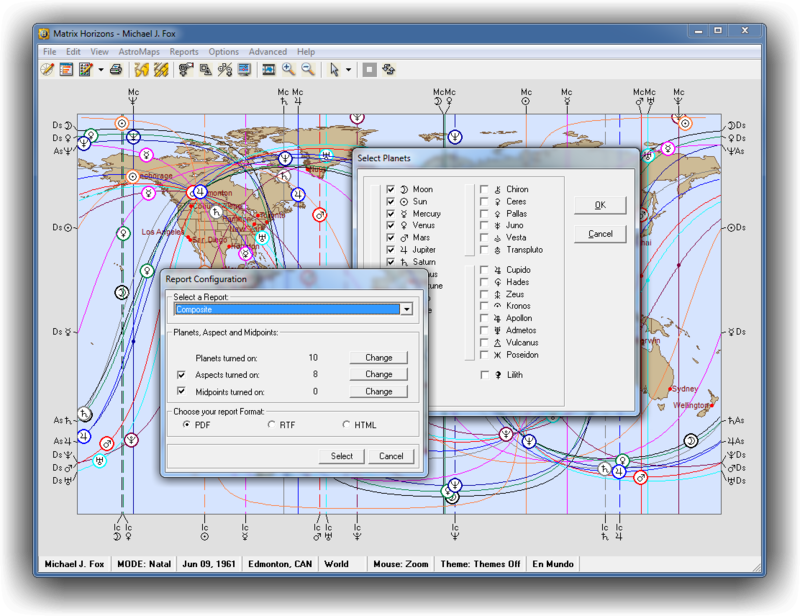 A mouse click will also let you display a relocated natal wheel, composite, transit, CycloCartoGraphy, or Local Space, for any location. 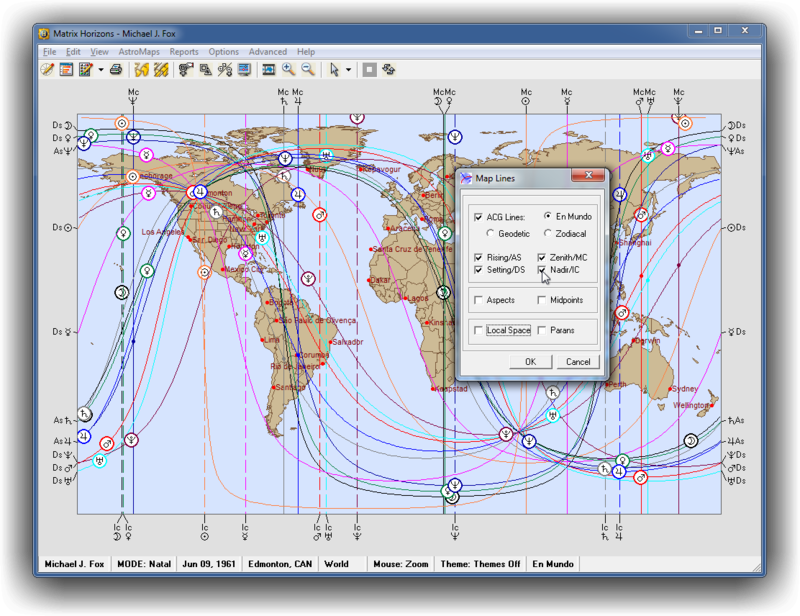 No fumbling with menus, just click and there you have your chartwheel. 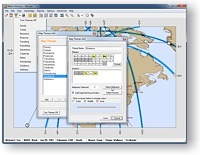 Move around the world as if in your own private jet; choose a region, a continent, or a specific location. Click the mouse and zoom in for a close-up. Right click, and then widen the view to see what's around you. 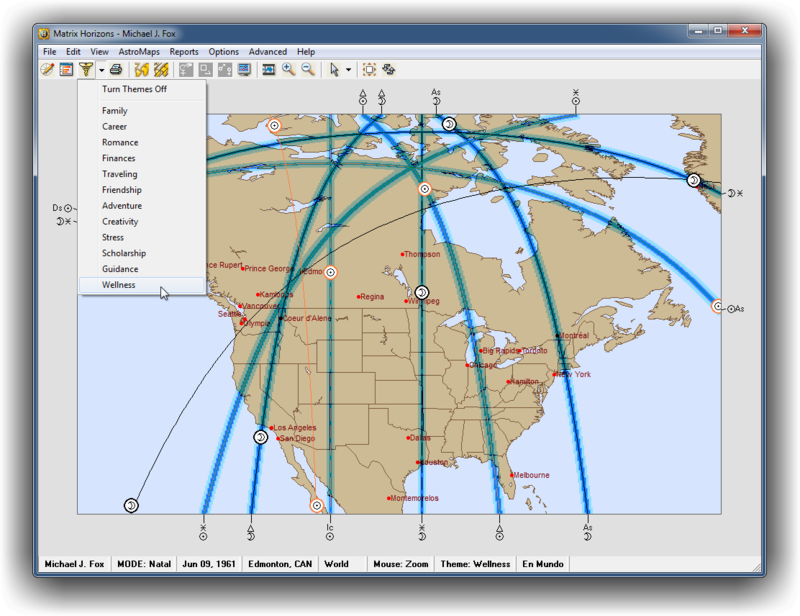 Quickly add or delete cities from your maps using the complete ACS atlas, which has over 258,000 locations, and is included free in your Horizons program. City Scoring: this is an innovative and simple way to evaluate any city or cities you select. 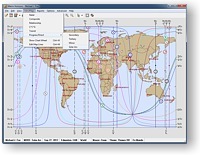 Create your own list of cities and move back and forth through the display to compare the significance of whatever planet or planets you select in an easy-to-read graph. There is no easier way to evaluate any of the locations you may be considering anywhere on the planet. Click on the thumbnail to pop-up a full size screen-shot. 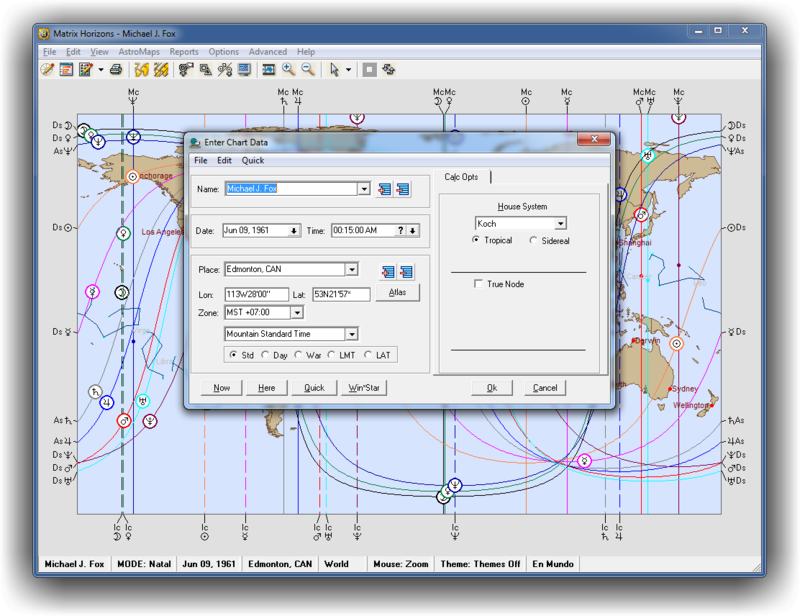 Entering a new chart, accessing saved charts or acquiring chart information from one of your other Matrix programs is quick and easy. 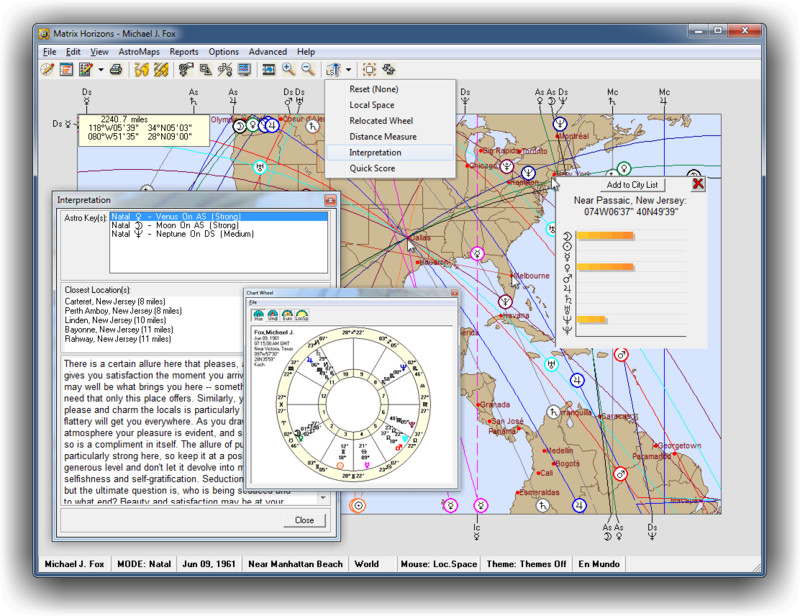 And, to assure correct longitude, latitude and time zone information, Horizons comes with the complete ACS U.S. and international atlas covering more than 258,000 locations. 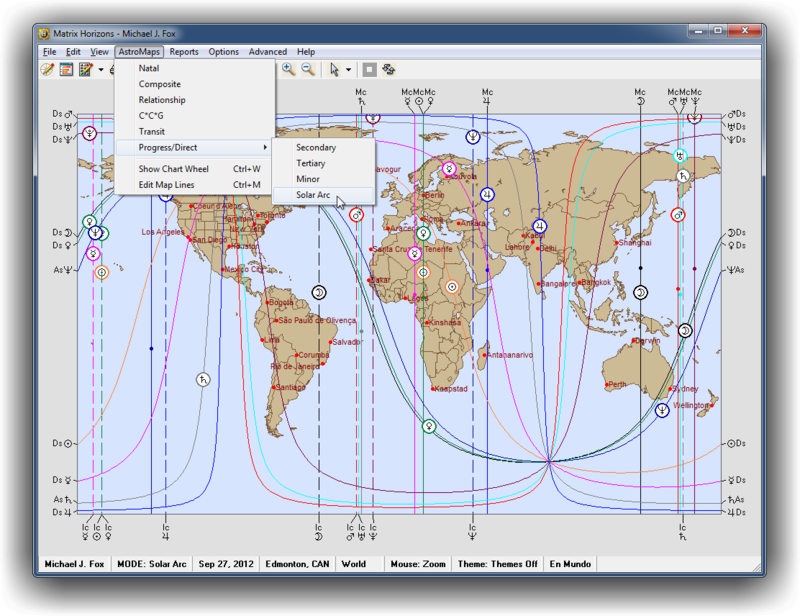 An animated map lets you view changing planetary influences. You have total control of the rate change and the speed of the animation; choose, seconds, minutes, days, months, or years. 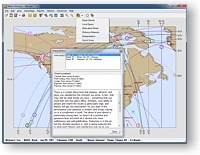 The Page Setup window gives you quick and easy control over the print output of your maps. 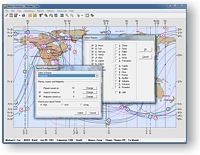 The Selecting the planets you wish to display on your map is easy. 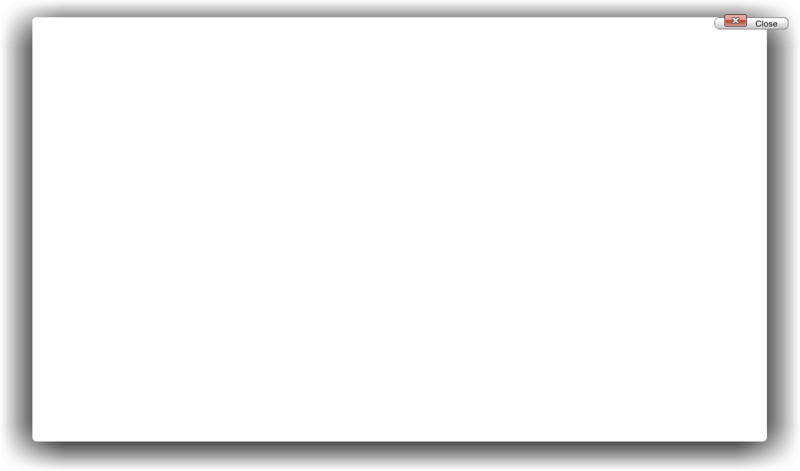 The Midpoints are a key to relocation. Matrix Horizons gives you the power to define exactly what you wish to view easily and quickly. Choose standard aspects sets or create your own custom aspects. Matrix Horizons is about giving you control. 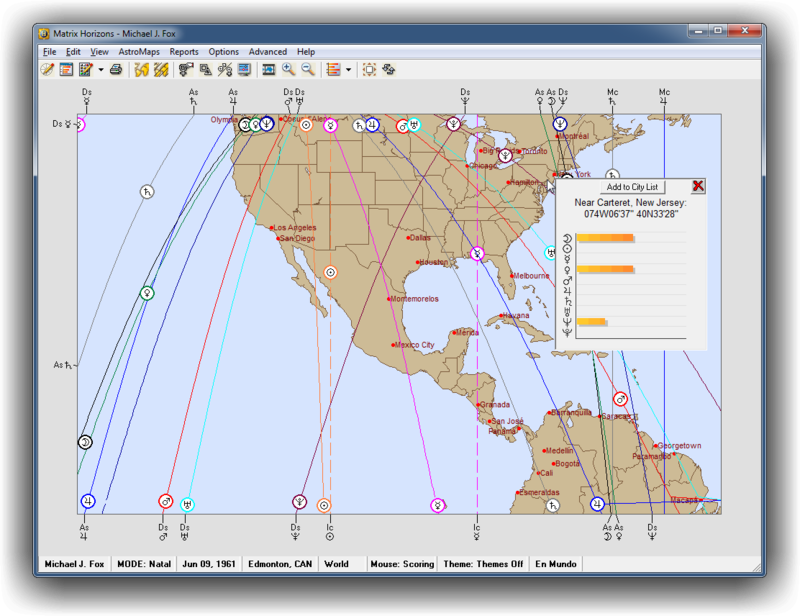 Horizons gives you the most powerful tool available in any program for viewing and analyzing planetary intersections. 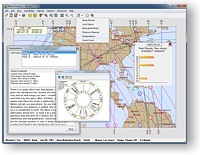 Matrix Horizons gives you more types of maps and greater accuracy. Choose: Natal, Composite, Relationship (Davison), C*C*G, Transit, Progress/Direct (secondary, tertiary, minor, solar arc). 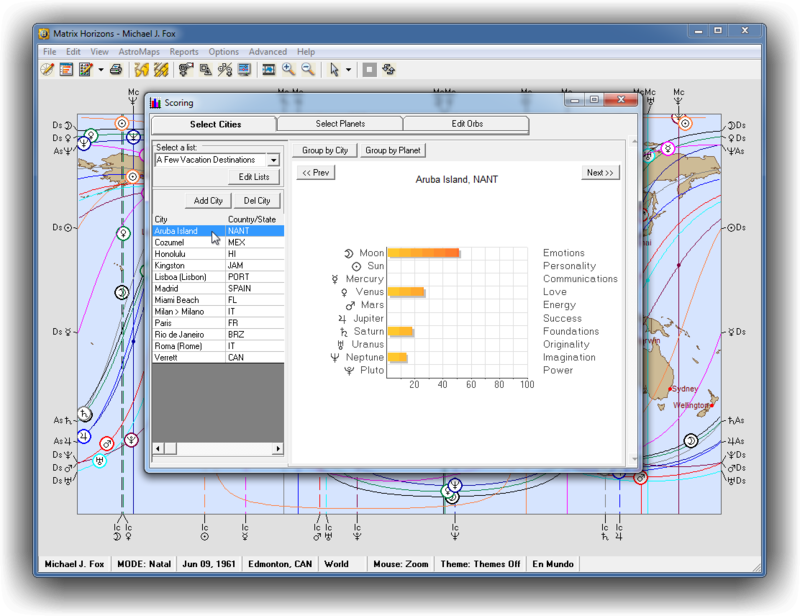 Scoring a city or group of cities is a powerful way to locate, and evaluate the influences present in a region or specific location. 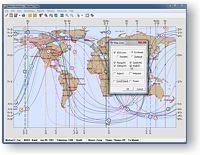 View by location, or by planet. Editing the degree of orbs from within this Scoring window gives you the ability to reach out and evaluate influences even at their distant edges. 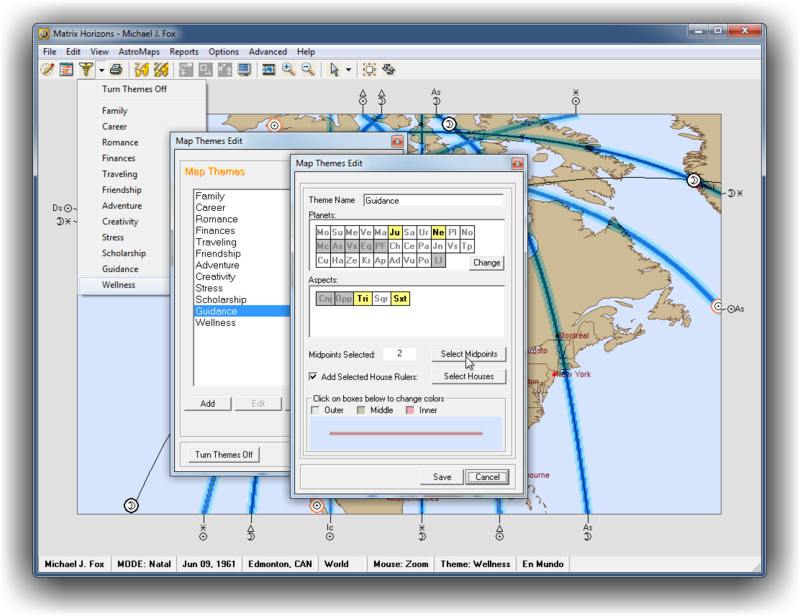 Turning on Themes is a way to focus your map and your search on specific interests you may have, and then view them on a global, regional or local scale. You aren't limited by our pre-selected themes, Matrix Horizons gives you the power to create your own themes and how they are displayed. 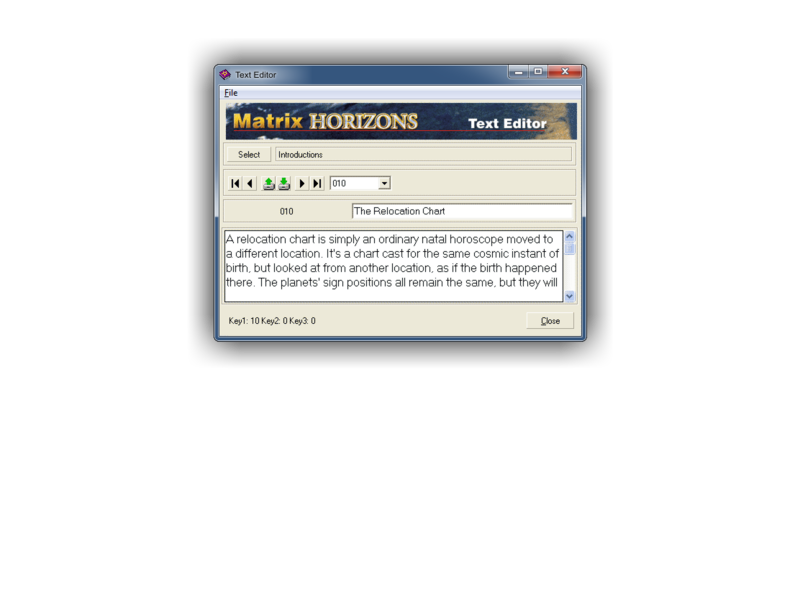 Matrix Horizons gives you the power to create your own themes and how they are displayed. 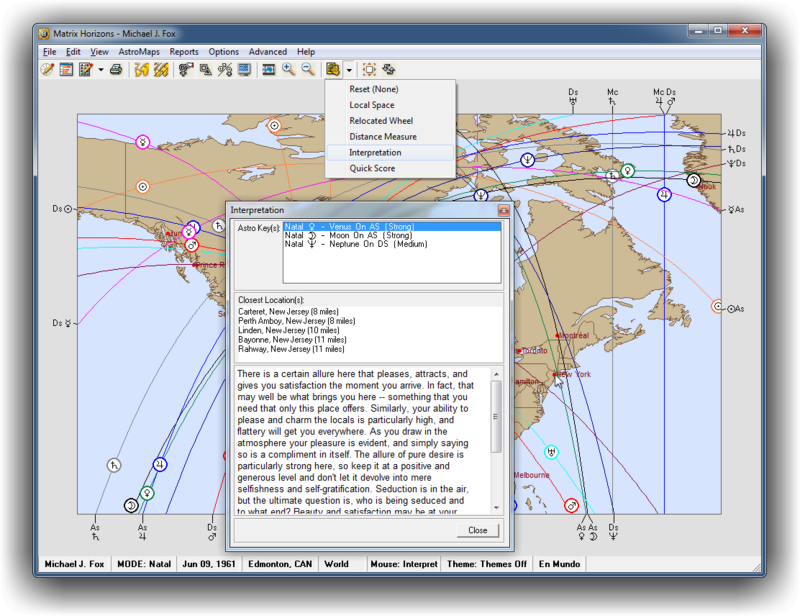 Onscreen Interpretations let you take a snapshot look at any location instantly with just the click of a mouse. Quick Scoring turn your cursor into an instant scoring device; click on a location and see what influences are present, and their power at sin that location. You Cursor in Matrix Horizons can instantly change its face and function to let you bounce around the globe and produce what you want, when and where. 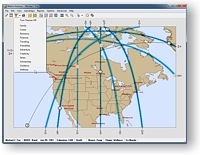 Click and show Local Space lines, a relocated chart wheel, create pop-up interpretations of a location, produce and instant Quick Score chart, or use your cursor to measure distances. 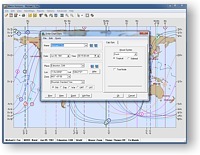 Horizons Toolbar is intuitively designed to give you fast access to the full range of tools and options that the program puts at your fingertips. 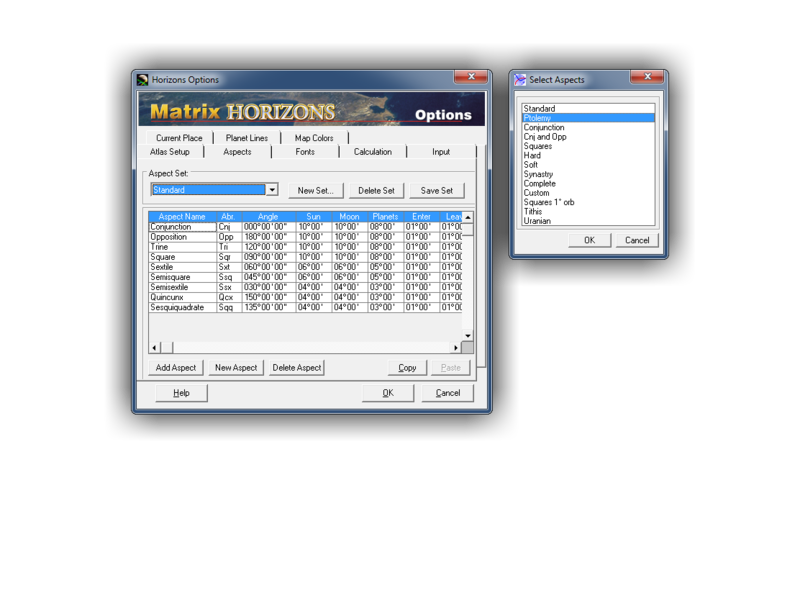 Like all Matrix Professional level software, Matrix Horizons is designed to let you make the program your own. Matrix Horizons not only offers the most comprehensive range of relocation reports ever produced by a relocation program, it gives you complete power in shaping the reports you create from the chapters and sections of a report, to editing individual reports, or even making permanent modifications to the foundation text to include your own. 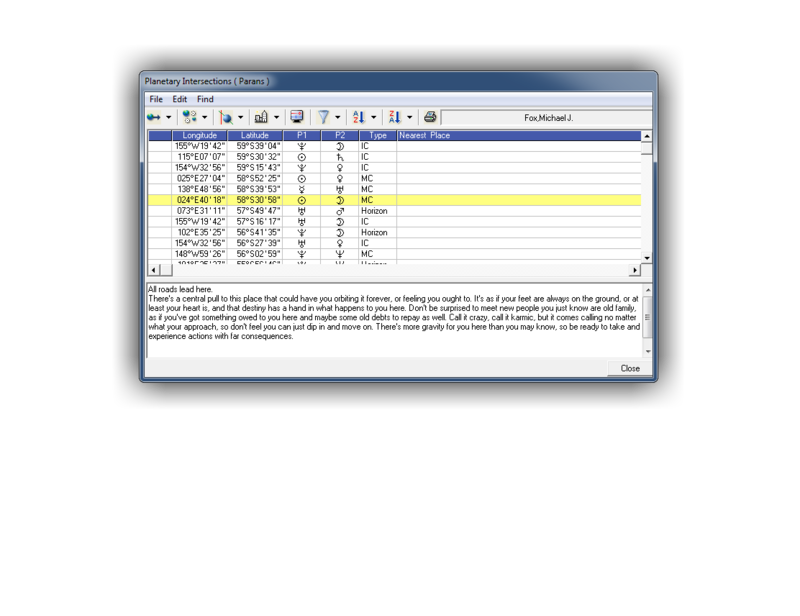 Within one window you can control the report you want to create and all of the calculations and elements that determine the final report. No program gives you this kind of control over the reports you produce. Combine this with the built-in editor and you have the ultimate Professional relocation report tool. 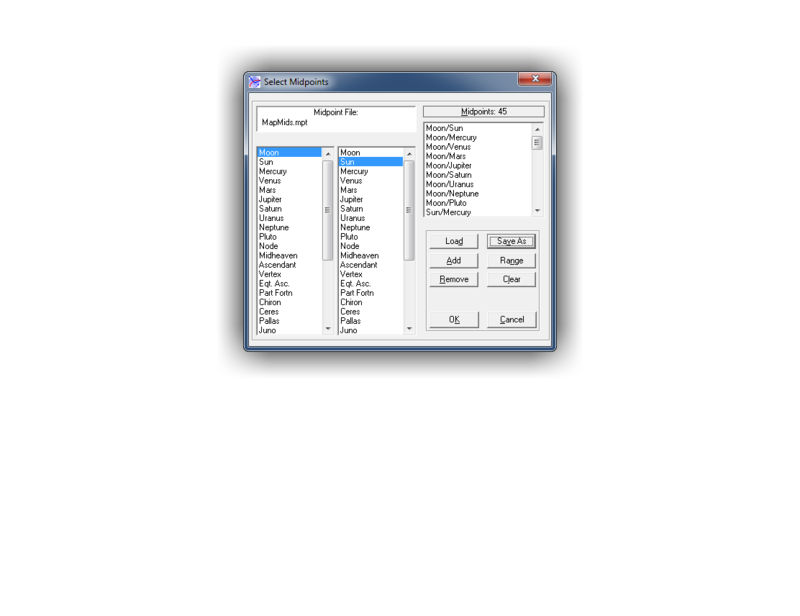 As with most software programs, you can set your personal preferences for certain options so that you will not have to change them when using the program. Available Hard-Drive space 90 Mb free.